X2O Media has partnered with Park Nicollet Clinic - Champlin in Minnesota to implement a comprehensive digital signage network designed to facilitate interaction with patients and staff throughout the healthcare facility. The dynamic network augments the clinic patient and guest experience with on-demand video content, provides interactive wayfinding, and highlights social media updates in real time. The clinic's interactive digital signage network consists of digital screens and interactive touchscreen displays that provide guests with dynamic staff directory information in the lobby; on-demand health videos and e-documentation for patients; links to entertaining videos for children; and onscreen QR codes for visitors to download maps directly onto their mobile devices. The screens also feature content from Facebook, Reuters, and local news, as well as real-time weather conditions and forecasts. 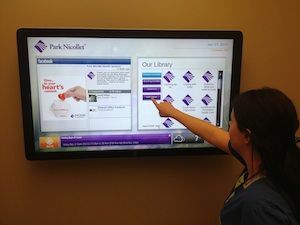 "With our new digital signage network, patients can now access interactive materials directly from their rooms just as visitors are able to retrieve information on clinic staff, find their way throughout our facility, and much more," said Sue Coller, office supervisor for Park Nicollet Clinic - Champlin. "In addition, the X2O platform's integration with the third-party Cisco player has simplified content management for our staff, and its flexibility enables us to send targeted information to specific screens." The X2O platform makes it easy to create rich media content for any application. Built using the HTML5 standard, its authoring application features intuitive, drag-and-drop tools to let users quickly create media-rich channels featuring HD video, still images, 3D animations, PowerPoint slides, and data-driven graphics linked to databases such as SAP and Oracle, Excel spreadsheets, and RSS feeds. The software also provides the cloud-based X2O Channel Designer, which can be accessed from anywhere via a Web browser. In addition, the open X2O platform easily integrates with third-party media players such as the Cisco IEC 4632. "We've designed the X2O platform to be the simplest, most versatile content management system available," said X2O Media president and CEO David Wilkins. "Combining powerful features, easy-to-use tools, third-party system integration, and the ability to display a wide variety of content including social media and user-generated content, facility-wide digital signage deployments such as Park Nicollet's are designed to ultimately enhance the user experience." The X2O platform allows users to harness the power of social media by displaying user-generated content from popular websites such as Twitter, YouTube, and Facebook. Interactivity can be added easily by displaying QR codes that users can scan with their mobile devices. The X2O platform also enables easy content publishing to a variety of devices, including desktop PCs, tablets, mobile phones, and digital signage kiosks and displays.